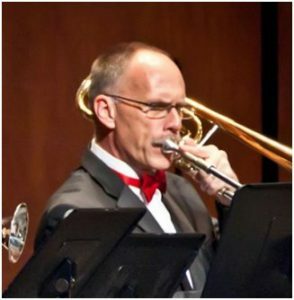 Principal trombone Gregory Lamy has been a member of the Folsom Lake Symphony since 2005. He also plays for the Auburn Symphony. Greg attended the University of Denver on a music scholarship, earning a bachelor’s degree in physical geography and minors in computer science and music. Greg retired from Intel in 2014 after 28 years of systems engineering and soon after started a new career with a software integration company in Loomis. He is in his 18th year of coaching women’s basketball at Oak Ridge High School in El Dorado Hills and is the club manager for the El Dorado Hills Women’s Basketball’s AAU program. Greg served as a high school youth counselor with his wife at their church in Rescue for more than 20 years, writing and directing 20 musical comedy stage productions during that time. These days he spends the majority of his free time backpacking throughout the Sierras, logging over 500 miles of back country trails in each of the past few years.